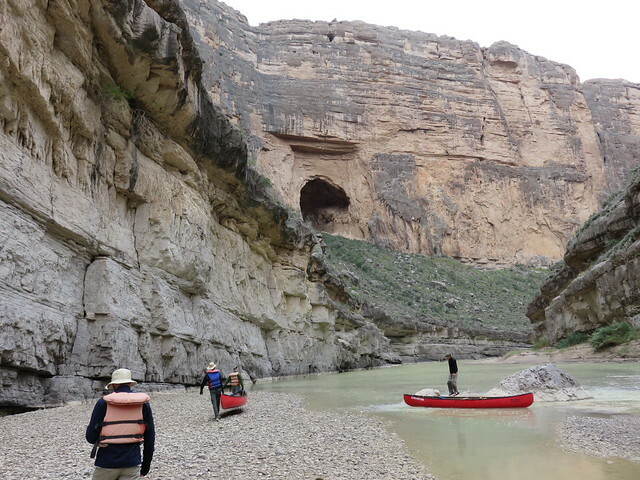 I have read that one can paddle upriver from the mouth of Santa Elana Canyon until "can't" and then turn around and let the current wash you back down river to your beginning point. Is there likely to be enough water flow to do this in early August? What day would you like to meet up? I can't specifically answer your question, but we went up as far as Fern Canyon in canoes in January 2015. Had to carry at a couple of points, but not far and just across some gravel banks, maybe 50 - 100 feet at most. I wouldn't exactly deem it portaging. I don't know one way or the other, but, isn't too hot to float the Rio Grande in August?